Ray Whitney found Radim Vrbata at the back door on the power-play with a beautiful cross-ice feed to make it 3-0 as the Phoenix Coyotes secured a valuable 4-0 victory over the Anaheim Ducks on Saturday night. That play has been a regular occurence all season long between two players who have developed tremendous chemistry. However, it had a bit of extra significance on Saturday. Ray Whitney raised his arms into the air and Vrbata rushed to grab the puck. One of the game’s most likeable veterans had just joined the 1,000 point club. It wasn’t a surprise with the potential for Ray Whitney to hit the 1,000-point mark before the end of the season has been talked about almost non-stop over the last two weeks in Phoenix. It was not hard come by as the veteran has been racking up points at a great pace all season long. Nor did it come in dramatic fashion like it did for Shane Doan earlier in the season when he scored his first NHL hat-trick. However, it was possibly one of the most celebrated moments amongst the organisation and its fans all season long, and that is saying something for a franchise that is on the verge of making the playoffs for the third consecutive season. Ray Whitney becomes just the 79th player in NHL history to reach the 1,000-point mark. His path to that total has not been easy and the 39-year old, who turns 40 in May, has had to deal with being under-rated almost throughout his entire career. It seems fitting that his latest team should be the Coyotes, a team that has made the playoffs in the last two seasons and is competing for a third straight postseason appearance, despite being written off as a bottom tier team in all three. Ray Whitney spent his first six seasons with the San Jose Sharks. Despite scoring 40 points in two of those seasons, he was bought out after the 1996-97 season, one spent almost entirely in the minor leagues. A tryout with the Edmonton Oilers offered a lifeline to an NHL career that appeared to be heading South, but Whitney lasted just nine games with the Oilers, before he was waived. That’s when Ray Whitney’s career finally kicked off. The Florida Panthers took a chance on the 5′ 10″ winger and it paid off big time. He scored 61 points in 68 games with Florida after being claimed. He would follow it up with 64 in 81 (1998-99) and 71 in 81 (1998-00). After scoring 31 points in 43 games in the 2000-01 season, he was traded to the Columbus Blue Jackets for journeyman Kevyn Adams and a fourth round selection. Whitney found immediate success playing on a Blue Jackets team still struggling to establish itself as an expansion franchise. He scored 61 points in 2001-02 and 76 in 2002-03 before becoming a free agent. He spent one season with the Detroit Red Wings before the lockout, but the salary cap prevented Detroit from re-signing him. The lockout brought about new rules that were always going to help the small, skilled winger. He was signed by the Carolina Hurricanes and immediately set a career high with 83 points in 81 games. Ray Whitney wasn’t done though. A Hurricanes team built with speed, a strong power-play and transition would win a surprising Stanley Cup in 2006 with Whitney scoring nine goals and 15 points in 24 games. He would score 61, 77 and 58 points in the next three seasons, but would be under-rated again after being let go as a free agent by Carolina in 2010. The thinking was that the 38-year old’s best days were behind him and that he could not be a part of the future in Carolina. Amazingly, Ray Whitney signed a two-year deal with Phoenix at just a $3 million cap hit. One of the league’s most under-rated players and one its most under-rated teams had been united, and it was only a matter of time before the match would click. Whitney scored 57 points in his first season on the desert. The team made a second straight postseason, but got bundled out by Detroit in the playoffs for the second straight year. However, better was to come. Serious doubts were once again voiced over the Coyotes ability to compete with the loss of Ilya Bryzgalov. Mike Smith has stepped in and done a superb job in net, but it has been Ray Whitney and his 75 points in 79 games that has driven a Phoenix offense, which has dropped off compared with the previous two seasons. At 39 years old, Whitney is just eight points off of a career high. He probably won’t reach that, but posting his second highest career total should be considered no less impressive. It isn’t clear what he will do next season, but it’s pretty clear that he will be in the NHL. Reaching the 1,000-point mark has surely ensured one thing for the veteran and that is that Ray Whitney will not be under-rated again. Finances and the future remain uncertain in Phoenix. It is quite possible that GM Don Maloney will struggle to keep Whitney in the desert for the 2012-13 season. 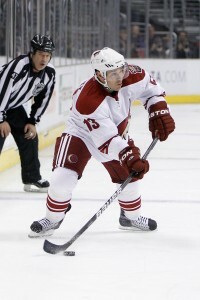 However, while the link has only been a short one, Coyotes’ fans have loved watching Whitney play and he will never be under-rated in Arizona for as long as hockey is played there.